The Mabee Center, an outstanding collegiate arena, has been home to the Golden Eagles since 1972. The arena bears the name of John and Lottie Mabee, who established the Tulsa-based Mabee Foundation in 1948. The benevolences of this foundation are evident throughout the Southwest where many edifices bear the name. Mabee Center was built as an elliptical cable-suspension structure with basketball in mind. The arena has 10,575 permanent theater seats - with no obstacles to clear viewing. The splendid viewing and playing areas have drawn nine different national tournaments since the building opened. The Golden Eagles themselves played in the first NCAA tournament held here in 1974. Four other NCAA regionals (1975, 1978, 1982 and 1985) have been based at the Mabee Center. 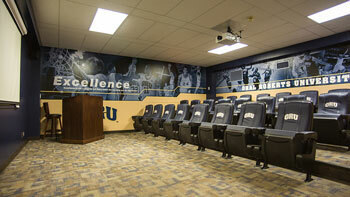 The National Invitation Tournament picked ORU as host four times (1977, 1980, 1982 and 1983). Mabee Center also annually hosts the Oklahoma state high school playoffs and the Oklahoma Coaches Association All-Star games. It was also the former site of the NAIA National Basketball Championship. Mabee Center regularly plays host to various conventions, conferences, seminars, and special events such as the annual Miss Oklahoma pageant. In the past, Mabee Center has hosted such top-name per formers Elvis Presley, Garth Brooks, Willie Nelson, Reba McEntire and Blue Man Group.